Stepping into the center hall of Home Hill Inn, you know you have arrived somewhere very special. 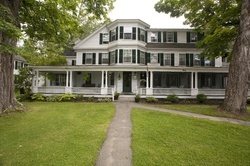 The circa 1813 Federal Style Main Inn has been lovingly restored and exquisitely decorated and furnished with an eclectic array of fine antiques, rustic French country style furniture, beautiful Oriental rugs and unique furnishings and objet d’art reminiscent of the French countryside. The level of simple country elegance and quiet sophistication that pervades every aspect of Home Hill Inn is rarely achieved at most Inns. 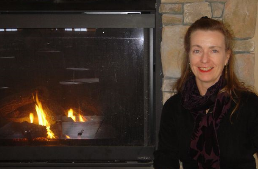 The current owners’ drive for hospitality excellence resulted in the creation of one of the “creme de la crème” luxury Inns of the northeast and, in its early years, earned it prestigious Relais et Chateaux and AAA Four Diamond designations. Home Hill Inn features 11 guest rooms and suites, a 53-seat Formal Dining Room and two intimate dining rooms, a new Tavern Bar and a state of the art commercial kitchen. The layout and amenities of this exceptional hospitality property make it ideally suited as a wedding destination. Classic tall French doors open from the Tavern Bar and Main Formal Dining Room to spacious brick terraces overlooking the meticulously maintained grounds. 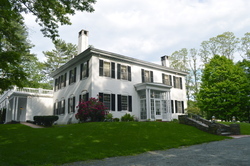 The Home Hill Estate includes 25 acres of meticulously manicured lawns and gardens, fenced horse pastures and lightly wooded forest overlooking the Connecticut River just a 20 minute drive south of Hanover, home to Dartmouth College and the Dartmouth-Hitchcock Medical Center. Amenities include an in-ground swimming pool, red clay tennis court, French Petanque court and putting green. Home Hill Inn is Exclusively Offered at $2,100,000 including a large, detached owners' residence. I have a question about the property at NH (#X23353137). I would like to schedule a visit for the property at NH (#X23353137). Looking for a Trendy Boutique Hotel Project? Unique find! Originally built as a tobacco warehouse in 1870, this historic building was transformed into a modern, 20-unit boutique hotel in 1988. Reproduction brass chandeliers hang from 9' high ceilings and period vertical wood paneled walls are covered with historic photos and vintage posters associated with the original tobacco warehouse. Massive hand hewn beams and vestiges of the original tobacco elevator have been preserved and showcased in the hotel's guest rooms and hallways. All of the guest rooms feature dramatic 9' ceilings with exposed beams and are, by industry standard, quite large. Current owners have architectural plans and permits to add kitchens to 8 deluxe guest rooms to facilitate extended stays. The scenic Litchfield Hills have been the haunt of multitudes of affluent urbanites seeking a restorative respite in the country for decades. Litchfield County is well known for some of the best antiquing in the country and as a thriving cultural center for the arts, music, theater and, of course, fabulous dining establishments. 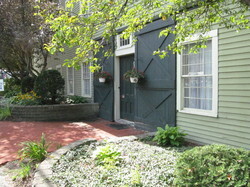 The location of this unique lodging property is ideally suited as a starting point for tourists following the popular Connecticut Wine Trail. The property also lends itself to the development of food and beverage service. A wine bar perhaps? Exclusively Offered at $1,100,000 with possible owner financing. I have a question about the property at CT (#X55347306). I would like to schedule a visit for the property at CT (#X55347306). This well-established Inn is well known for its casual, fine dining, creative catering, and whimsically charming lodging accommodations. 11 guest rooms with private baths, two intimate dining rooms, a screened dining porch, a small pub and owner/manager’s apartment. Secondary owner financing to qualified buyer! This Inn has been whimsically decorated with an artistic flair and botanical theme throughout. Soft, mesmerizing, garden greens are the predominate choice for wall colors accentuated by enchanting artistic renderings of flowers, fruits and vegetables in fabrics, wall coverings and objet d’art. The Inn’s period features inspire a bit of nostalgia, while the tasteful decor sets the mood for a fine, contemporary dining and lodging experience. There are two intimate dining rooms and a small, tastefully remodeled pub all serviced by a fully equipped commercial kitchen. This Inn has an excellent physical plant with extensively updated structural and mechanical systems including a sprinkler system installed on all floors. There are 11 guest rooms with private baths, each individually decorated with a penchant for color and comfort. There are a variety of bed sizes and styles from antique white and black wrought iron beds to elegant four-poster and canopy beds each outfitted in luxurious high thread count linens, goose down comforters, colorful duvet covers, accent pillows and shams. Bathrooms feature period or reproduction fixtures like claw foot soaking tubs and pedestal sinks. This popular Inn is located on the outskirts of one of the state’s most vibrant business and cultural centers. The incredible natural beauty of the region has been a draw for artists, writers, musicians and craftspeople for over a century and it’s a top destination for outdoor recreation enthusiasts. Strong financial performance over a 10-year period under current ownership supports the asking price and conforms to current commercial mortgage criteria. Participatory owner financing is another potential perk! I have a question about the property at VT (#X49692721). I would like to schedule a visit for the property at VT (#X49692721).